It's a service fraternity. When most people think of fraternities, they think of social fraternities, in which the greatest emphasis is placed upon a sense of belonging to a group. Wild Parties, flag football, pranks... all fine in their own right. But Alpha Phi Omega has a greater cause: that of service. Under the guiding principles of leadership, friendship, and service, Alpha Phi Omega provides service to the community by donating time and effort to various organizations and causes. It's open to anyone. First of all, even though we are technically a fraternity, membership in Alpha Phi Omega is not open only to men. Anyone, from the brainiest bookworm to the wildest wild-child can join. You can even be in another social fraternity or sorority. The only criterion is that you have an earnest desire to help out those that need it. It's a national organization. It's not only here that students have the opportunity to join this great organization. 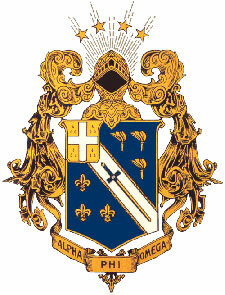 In fact, Alpha Phi Omega is the largest co-ed service fraternity in the world, with more than 256,000 members on 687 campuses across the nation. Interested in joining? Click the Join tab at the top of this page for info on the next meeting and stop by! Everyone is welcome at APO!